Montenegro and Italy became the first teams to four wins in the 2013 EuroBasket Qualifier tournament on Friday with wins over Iceland and Belarus, respectively. In Helsinki, Finland and Belgium went in as the only to undefeated teams in Group E, but when the dust had settled, Finland stood atop the group standings with a sound 97-60 victory. Serbia kept the top of Group A close with a convincing 88-63 win over Estonia at home in front of a crowd of 7,250. The win moved the Serbs to 3-1 and dropped Estonia to 2-2. Estonia had the lead at 13-12 midway through the first quarter, but a 14-2 run by the hosts put the score at 26-15 at the end of the quarter. A 24-13 second quarter put the game basically out of reach at the half, 50-28. Estonia managed to outscore Serbia 22-18 in the final quarter, but it was too little, too late. Nenad Krstic and Milos Teodosic lead the Serbians with 12 points apiece, Danilo Andjusic and added 11. Reinar Hallik paced Estonia with 11 points and Siim-Sander Vene contributed 10. Montenegro stayed at the top of Group A with a sounding 85-67 win over visiting Iceland. With the victory, Montenegro improved their record in Group A play to 4-0, while Iceland dropped to 1-3. The squads played at Niksic in front of a crowd of 4,200. Iceland played the hosts even in the second half, unfortunately Montenegro had built 48-32 at the end of the first half, including a 13-point run to open the second quarter. Bojan Dubljevic led Montenegro with 16 points, Vladimir Dasic added 15, Suad Sehovic dropped in 14 and Blagota Sekulic contributed 13 for the winners. 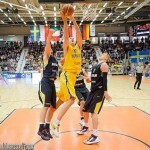 Hlynur Baeringsson led all scorers in the game with 19 points, Jakob Sigurdarson added 15 and Jon Stefansson scored 13. Israel traveled to the Slovak Republic and came home with a 2-2 record and a spot in the middle of the Group A pack with an 82-64 victory. 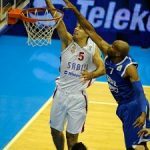 The only time the hosts led in this contest was early in the first quarter 11-10, from then on it was all Israel as they amassed a 27-20 margin after one quarter and had extended the margin to 47-35 at the half. With a 16-4 run early in the third quarter they were able to build a 69-47 lead after three quarters. The Slovakians did earn a four-point advantage in the last stanza, but they never mounted any serious threat and fell to 0-4 in Group A competition. Alexander Tyus led Israel with 18 points and Lior Eliyahu added 14. Anton Gavel was the only Israeli player in double figures, ending up with 22. Both squads came in to this contest with 2-0 records, but in front of a home crowd of 4,020, Finland walks away with a 3-0 mark and the early lead in Group E. With the loss, Belgium drops to 2-1 and to third place behind 2-2 Poland. Petteri Koponen entered the contest averaging 27.5 points per game over the first two contests Finland played in the EuroBasket 2013 Qualifiers. He added 21 points to his total in leading the Fins to victory, dropping his average slightly to 25.3 points per game. This match-up was close for the first two quarters with the hosts holding on to a close 19-18 advantage after the first quarter and a 37-32 margin at the half. 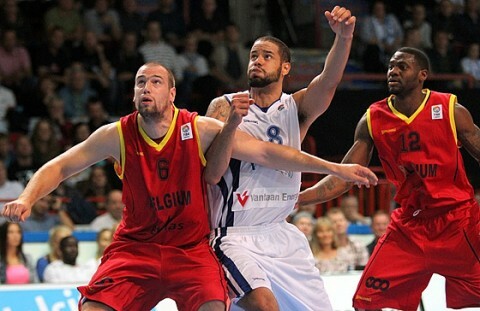 Belgium grabbed the first two points of the second half on a Maxime De Zeeuw dunk 18 seconds into the period. After that it was all Finland as they took off on a 23-2 run that essentially put the game in the books. Koponen led all scorers with 21, Shawn Huff added 17, Mikko Koivisto added 12, and Tuukka Kotti dropped in 11 for the Fins. Sam Van Rossom was the only Belgian in double figures, contributing 11 points. Italy also moved to 4-0 and solidly on the top of Group F with a decisive 84-63 win over Belarus in Minsk. The final score doesn’t accurately reflect how close this contest was, as Italy went on a 10-0 run to finish the game, just after Belarus had cut the margin to eight with 3:27 to play. Italy opened the match-up with an 11-2 run, only to have the hosts counter with a 9-2 run of their own to cut the advantages to 13-11 with 3:06 to play in the first quarter. Four Italian free throws and a three-pointer put the margin to seven, but a three by Aliaksandr Kudrautsau brought the score to 20-16, only to be countered by Giuseppe Poeta’s driving lay-up with a couple of ticks left on the clock. Italy held a slim 22-16 lead going in to the second quarter. Two free throw and a triple for Belarus cut the lead down to three, but three minutes later the Italians took advantage of the charity stripe themselves and expanded their gap to eight points by dropping in four of four from the line. Belarus wouldn’t give up though and played Italy to an 18-18 tie of the second quarter, keeping the six-point lead the same as after the first, 39-33 in favor of the visitors. It took the two squads over a minute to get the ball to fall through the hoop to start the second half, but once it did they exchanged baskets without a miss for the next minute until Angelo Gigli block Kudrautsau’s layup with 7:38 to play in the quarter. The game started to open up near the end of the quarter when Luigi Datome drained back-to-back threes taking a six-point game to 12 in 40 seconds. Two free throws by Marco Cusin and then Poeta’s three with 32 seconds in the frame stretched the margin to 17 and Kudrautsau’s two free tosses with 15 ticks to play in the quarter brought the Belarus deficit to 15 with 10 minutes to play. With 7:42 to play in the contest Dzianis Korshuk dropped in a three-pointer, on the defensive end of the court Korshuk grabbed an errant jumper, drove the floor and pulled up for a 15-footer that fell through to cut the lead to 11 with 7:04 to play. Again Italy missed a shot and gave up the rebound to the hosts, only to have Dante Stiggers nail jump shot of his own to cut the margin to nine with 6:28 left in regulation. Stefano Mancinelli put some reality back into the contest by knocking down a three-ball to bump the span to 12, but Kudrautsau countered that when he was fouled attempting a three-pointer of his own and sank all three of his charity tosses. Datome wasted little time getting those points back with a deuce at 5:25 to play. Just when the game was flowing smoothly, the two squads decided to slow scoring down and missed two shots each and coughed the ball up twice each over the next minutes and a half. Time was running out of Belarus and Poeta’s two free throws grew the margin to 13 with 4:18 left. Pavel Ulyanko did his part sinking a three and Kudrautsau drove the lane for two, bringing the margin back down to eight, 69-61, with 3:27 on the clock. Datome canned a jumper behind the arc to start the Italians final charge to the buzzer, ending in a 15-2 run and an 84-63 victory. Datome put on a three-point shooting seminar, dropping in six of seven from behind the arc and ending with 22 points, Danilo Gallnari added 19, including a nine for 10 performance from the charity stripe, for the winners. Kudrautsau finished with 19 points for Belarus, in part from going nine for 11 from the free throw line. 3 Responses to "Finland shocks Belgium, Montenegro and Italy first to 4 wins"
Not for the players – that makes the season almost a month longer.